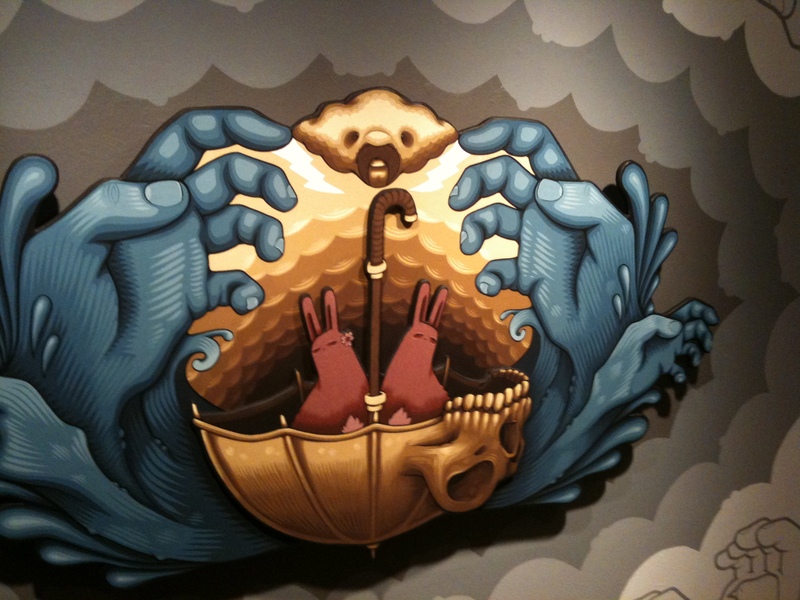 Jeremy Fish's "Weathering the Storm" opened in November at the Laguna Beach Art Museum to a full house.Viewers of all ages were captivated by Jeremy's, seemingly effortless, ability to recount tales of social calamities through his iconic characters. His fresh color combinations and satirical imagery lent a lighthearted feel to a show which pointedly exposed the (hopefully temporary) derailment of American society. Evan Pricco, managing editor for Juxtapoz magazine, has offered up a preview of his January Show Stopper which covers the momentous occasion and the opening night sentiments more eloquently than I. I'll leave you with the words of Mr. Pricco. Happy Holidays from FIFTY24SF! Jeremy Fish didn’t know what to expect the evening before his Laguna Art Museum opening. He had spent the prior week hanging the work in the gallery, nearly a full year creating the pieces, and was just now taking his first walk through the exhibit with an outside audience. A typical Jeremy gathering, stereotypes in full-effect, tending to be of the creative young adult set: skateboarders, surfers, sneakerheads, and SPBs. Among the best artists of our time to combine the lifestyles, over the years Jeremy has become one of fine art’s most renowned storytellers. As the years have rolled on, Jeremy has been a confident builder of tales, concepts, and environments. His Barbary Coast show last year became a unique picture book experience on the history of San Francisco. Weathering the Storm explores the “transformation and rebirth through struggle,” a timely concept given that most people you know are out of a job or out a savings account. Through his bunnies, beaver, birds, and skulls, his world evolves despite adversity, creates new beginnings and says hello/goodbye to the past. The exhibit features wonderful literature provided by both Fish and Laguna curator Grace Kook-Anderson, bringing an essential academic outline of the work to an audience unfamiliar with the artist. One thing for certain, as Jeremy is coroneted into the museum world, he is becoming a subject worthy to write about in historical context. If a Cat with a Hat can change the world, why can’t a Silly Pink Bunny? Please conatct the gallery if you have any questions regarding this exhibition.